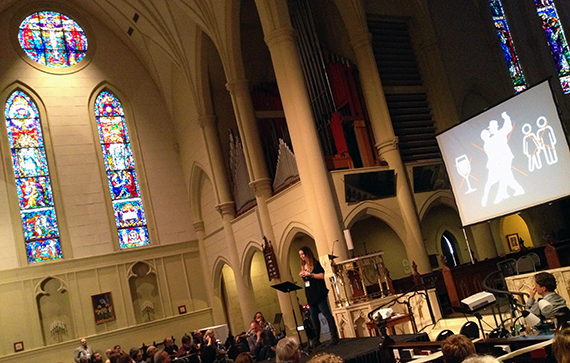 By far my favorite part of the Emergence Christianity event was the opportunity to hear PechaKucha presentations. If you aren’t familiar wtih PechaKucha talks, you can find out more here. Essentially, each presenter is allowed 20 slides, and the 20 slides rotate every 20 seconds. It gives each speaker a 6:40 presentation, and requires you to be pretty succinct and clear in what you’re preparing. I decided to offer a PechaKucha on my experiences of being a host at Theology Pub. I put my slides up on Slideshare, and you can view them here (or look at the bottom of this post). Melissa Greene: Melissa and I connected on Facebook a year ago when she had found an old blog post of mine about Liberal Worship Music. She is a former member of the Christmas music group Avalon and has a wonderful story. She shared her journey with us in her PechaKucha, and I know that if she ever decides to write a spiritual memoir, you’re going to want to buy it. Mike Stavlund: Mike and I have both lost children, and he shared with us some of his thoughts and experience with grief. He has a new book out called “The Force of Will” that I would highly suggest you checking out. Barry Taylor: Barry is a friend who I’ve enjoyed running into at some events over the past couple years. His presentation consisted of a few reflections on church and theology, which were even more poignant with the addition of his images, particularly the one below, which he simply displayed for 20 seconds without adding any commentary. Doug Pagitt: Over the past year, Doug has started running, and so he shared with us his spirituality of running, and how the experience of becoming an ultramarathoner has changed him. I connected with a lot of what he said, and was left wondering what it’s going to take me to get back into the running zone that I’ve been in on and off for the past 3 years. Bruce Reyes-Chow: Bruce was the bold one in our group who went first and showed the rest of us how to do a PechaKucha talk. He shared some slides about race (both funny and challenging) and got people excited about his upcoming book on race. I’m really looking forward to the next time I get a chance to present a PechaKucha talk, and have already been thinking about how this could be a new way of sermon delivery. Obivously, the images have the potential to add so much to what you want to share. And having to do something that presents an idea quickly, effectively and in a way that uses images that stick with people more than just words, could help engage our congregations more. « Emergence Christianity: Is Emergent a Conversation or a Movement? 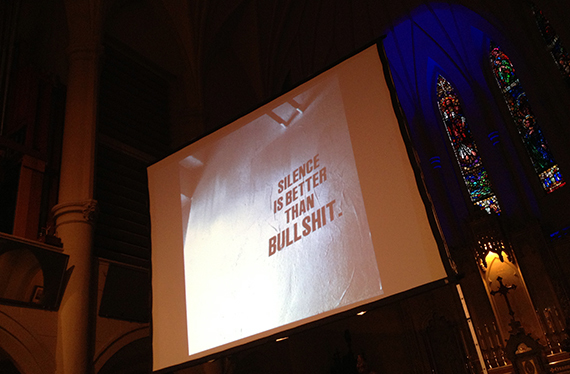 PechaKucha Presentations is a breath of fresh air. Thanks for sharing.